iStat Menus appeals to those who love to keep a close eye on a system's performance and need detailed information available at the click of a mouse. The product is in two parts: one that's essentially a fancy preferences panel, plus several modules that live in the menu bar. 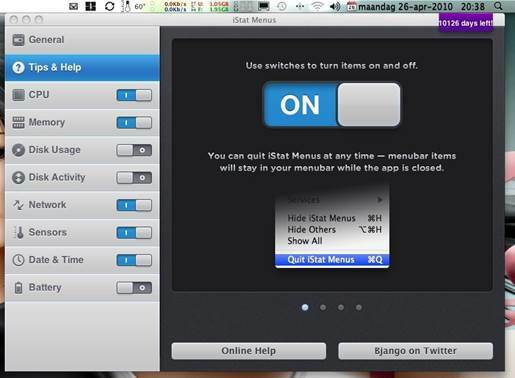 You use the former to toggle and configure the latter. Each module performs a separate task, enabling usage-monitoring for CPUs, memory, disks, batteries and network activity. A drop-down with extensive data is available by clicking any module. There's also a time module, which can house a world clock and calendar events. In the version we tested, old events are hidden, but there are plans to merely dim them in an update. History graphs now provide historical data for the previous hour, day, or week. The bottom line. If you’ve used iStat Menus before, the update isn't essential unless you need Retina support, a more robust Mountain Lion experience, calendar entries, or new history graphs, which log hour/day/week histories for things like network and memory usage. We also weren't keen on the new preferences interface, which is fiddly and indistinct. But aside from issues with the disk activity module not working on one of our test Macs, iStat Menus remains impressive and useful. · (+) Time module still excellent. Useful history graphs. Robust and resource-light. · (-) Ul niggles and a few bugs.